Always an investment minded realtor, Jim Zeitler can help you find a place to put your money that might help your overall portfolio. Your dream of owning a second home in beautiful Cape May will be one of the better investments that you would make, too. The strong rental market in Cape May makes it a unique place to invest your money. Obviously you would want to talk to your accountant, but with real estate, you have tax advantages that you just do not get with other investments. You just can't depreciate a stock every year to save on your taxes! Moreover, if you end up loving Cape May more than you think (and you will), and you want to sell the first rental house that you purchase and buy something a little closer to town or to the beach, you can participate in a 1031 tax exchange and forgo paying capital gain taxes while upgrading your rental property. You can also sell real estate that is not in Cape May and use this exchange as a vehicle to help you purchase your own place in Cape May. Call Jim, get to know the town, and become informed by someone that knows the Cape May real estate market. You will comfortably find your Cape May dream house. On a personal level, Jim enjoys Cape May as much as anyone: riding his bike around town, going to the incredible beaches, and just walking around town enjoying the unique energy that only Cape May radiates. Jim Zeitler and his wife, Laura, purchased the Columbia House in Cape May. As a realtor, Jim shows a history of practicing what he preaches‚ to his clients: Cape May is a smart place to invest your money. 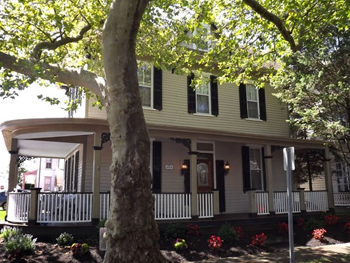 Now, Jim and Laura own a successful investment property in the heart of the historic district. Contact Jim‚ your local, friendly, professional realtor, and start living your dream of owning a Cape May County home or investment property.